Nowadays, more and more people are using headphones. Not just to listen to music on the go. But to watch movies and game with too. The reason is clear, headphones offer a far more immersive listening experience than speakers are capable of delivering. To keep up with this trend, we’ve been looking at a collection of budget (under $100) headphones. We wanted to review them, and find out which was the best, and why. We looked through a lot, listened to music on all of them, wore them for hours to test the comfort, and kicked them a bit to see how tough they were. The best set of headphones we looked at was the Sony MDR7506 Professional Large Diaphragm Headphones. In this article, we’ll talk about why the Sony model came out on top. We’ll also discuss some of the other excellent headphones we looked at. The whole point of reviewing products properly, is finding out what the customer is looking for. Once you’ve done that, you can easily test the headphones and find out which model performs best in those areas.And whichever one performs the best, is your winner. We thought we had a pretty good idea of what customers would think was important, because we ourselves all own headphones. But just to be sure, we did some surveys in order to find out what things experienced headphone users regarded to be crucial. We determined this final list by personally testing all the headphones that looked like they would fit this criteria. So, any that were known for being particularly uncomfortable, or having poor noise cancellation, we left out. Once we got them into the office, we had all of our staff have a go on them.The good thing about doing this is that you get a wide range of different opinions. Some people might like the sound quality of a certain pair, and another person might find it tinny or too loud. Another might consider a set of headphones extremely comfortable, but they might squeeze uncomfortably for someone with a larger melon. Our final 5 were the headphones that were preferred overall. Obviously there were some disagreements, but the consensus best 5 made it onto our list. The whole reason that anyone spends money on headphones in the first place, is to experience better sound quality. Whether you want to be able to hear every single note when listening to music, be fully immersed in a gaming experience, or transported to another world by a great film. Having headphones with outstanding sound quality can help you to achieve that. There are lots of different measures companies use to try and show you just how good the sound quality of their headphones is. You’ll hear them boasting about their ‘frequency range’ or ‘output level’. While I’m sure these things do make a difference. They are no guarantee of a good sound. 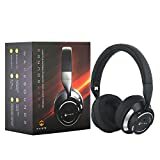 The best way to test whether a set of headphones has good sound quality, is to have a couple of people try them on, watch a movie or two, listen to some music, play some games, and tell you what they think. We roped pretty much everyone in the office into trying the different headphones we’ve listed here. We dragged them away from their meetings and jammed headphones on their skulls. We played them ‘Paradise City’ and ‘Thriller’ and we bombarded them with questions until they were sick of us. But we got our answers. So a very wide number of people have tested the sound quality of each of these headphones. They all have excellent sound, although obviously some are a little better than others. It’s very annoying to have to listen to someone else’s telephone conversation or music. If you live in a noisy neighbourhood, it can be difficult to watch T.V. or game at home, because of the sound coming from the street outside. The nice thing about a lot of modern headphones is that they can effectively block outside noise. 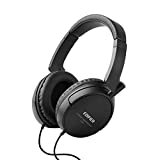 Whereas previously, you would have had to turn up the sound in order to drown out competing noises, nowadays you can simply get a pair of headphones which come with noise cancellation. So there’s no need to deafen yourself just to watch your T.V. shows. Testing noise cancellation is pretty easy. We had one volunteer put on the headphones, and pick a song they liked. As they were enjoying the song, another volunteer began to shout at them. The louder they could shout without the listener hearing them, the better the headphones noise cancellation was. We tried this with different combinations of listeners and shouters. In order to get a good average. Because of our thorough testing, we know that all the headphones in this mix have good noise cancellation. This is another absolutely crucial feature when considering a set of headphones. I’ve talked about it before, but comfort is something that’s so easy to forget about when everybody starts listing the fancy, high-tech features of their headphones. But it’s more important than pretty much any cool add-on you could think of. Because uncomfortable headphones won’t get used. You’ll wear them a couple of times, decide they hurt your head, and they’ll end up in a draw forever instead. So uncomfortable models are just a complete waste of money. Comfort is something that’s far more subjective than either sound quality or noise cancellation. People’s heads are very different sizes (and sometimes different shapes) so designing headphones that everybody finds comfortable is a serious challenge. Having said that, most of the pairs we recommend here were very comfortable for everyone in the office. Which is impressive. To really test their comfort properly, we had to wear them for extended periods of time. Because pretty much anything can be comfortable for half an hour or so. Because people can easily spend hours in their headphones at a time, we needed to make sure that these models were comfortable for a wide range of people, over a couple of hours of time at least. The comfort levels definitely varied, but overall these were easiest headphones to wear. Another underrated feature of any component (but particularly headphones) is durability. Your headphones get moved about a lot, you’ll take them to work, throw them roughly in your bag, and leave them in a tangled mess on the floor. So they need to be well made to stand up to the punishment. The areas that are most susceptible to wear and tear are the wires and the plastic headband. With the headband, there’s a danger of it snapping. So you want something tough but with enough give to get round your head. And with the wires, they tend to stop working if they’re not of good quality. So you’ll begin to find the sound quality dropping off. Firstly, we tested the durability ourselves. We threw the headphones at the wall (sounds silly but it works) a few times, and then tested to see if they still worked. We also played about with the headbands a bit, we weren’t exactly trying to snap them, but we just wanted to see how tough they were. We did end up snapping a couple of pairs while doing this. Secondly, we wanted to know about the long-term durability of the headphones. So we talked to the groups of users we surveyed, as well as checking online for any durability problems associated with the models. All the headphones we recommend performed well. Both in our testing and our research too. People now wear their headphones when out of their houses, probably more than they use them when inside. So, you want to have a decent looking pair that don’t get you laughed at on the bus. Some of these are really cool looking models, but most of them are a little more discrete. We would have liked to get some really stylish models, but to be honest most of the coolest looking headphones are either more expensive than $100, or they just don’t perform that well in the other categories we looked at. But they still all look good. Our number 1 pick, and the best model we looked at, was the Sony MDR7506 Professional Large Diaphragm Headphone. They’re really impressive, and for under $100 they’re great value too! The sound quality is very good, everyone in the office used them to listen to different genres of music. Some of us like rap, others indie, and one member of the staff even enjoys a little opera. 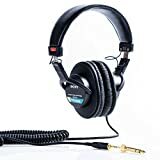 So the MDR7506s were used to listen to a wide range of different stuff. And everybody who used them reported that they sounded great. There is definitely something different about listening to music normally, and then listening to it with a really good set of headphones. That’s something these let you experience. They also offer excellent noise cancellation. The closed-ear design isn’t particularly ground-breaking in of itself. But the effect is very impressive. During our tests for noise cancellation, our volunteers who wore the headphones reported barely being able to hear the shouting of their colleagues. 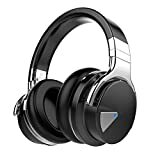 Considering the close proximity, and the fact that the music they were playing wasn’t especially loud, it’s clear that the closed-ear design offer great noise cancellation. Most headphones are comfortable to wear initially, but start to hurt your head (and ears) after half an hour or so. These headphones are different though. They’re not just comfortable initially, they’re comfortable even when being worn for hours at a time. We had members of our team with very different sized heads try them on. They all said these were the most comfortable set they’d tried. Some even said they thought they could sleep in them. If that isn’t a ringing endorsement, I don’t know what is. As we discussed, testing durability is harder than testing most traits is. But they performed well here too. They survived our very scientific ‘throw at wall’ test. As well as our ‘try and snap them in half’ test. We also got excellent feedback online regarding their long-term reliability. In terms of style we thought they looked great. Sure, they don’t stand out massively. But they’re cool and understated, so even though they’re not making much of a fashion statement, you’ll still look good wearing them. Paww have produced a great set of headphones here. The sound quality on them is excellent. During our testing, we used them to listen to a wide range of different music. The sound was clear throughout and there was no notable disparity between the low, middle, and high notes. Which can often be an issue with cheaper headphones. The noise cancellation on the WaveSound is brilliant. Apparently, they’ve been designed specifically for flights, and this is reflected in some of the features. We all know how noisy flying can be, the noise cancellation on these is so good that you could easily drift off to sleep on a busy flight. Even with no music playing. They’re also very comfortable, so if you did want to sleep in them, I’ve no doubt you literally could. This would come in particularly handy on a plane. As well as being comfortable, the Paww model is also durable, and has a reputation in the industry for being reliable and long-lasting. In terms of style, it’s a black design with silver accessories. So it looks good without being a show-off. The H840s combine great quality sound, with excellent comfort and decent noise cancellation too. They’re a good headset, but not quite as impressive as our number 1 pick. What impressed as particularly about the Edifiers was their durability. They don’t look like the toughest set of headphones, and they’re quite a bit skinnier than some of our other models, so I was fully expecting them to break in half when put under any strain. But they didn’t. Despite us chucking them at the wall, and giving them a good pull about, they stood up to our bullying. Because they’re quite a small, lightweight pair, I wasn’t expecting that. They’re also a pretty attractive set. Again, they don’t stand out massively, but they look good and they’re pretty cheap too. This is the best looking headset that made it into our final 5. They come in a cool black and red combination and are ridiculous comfy too, with squashy ear pads that cushion your head perfectly. The sound quality on these is also very good and they stood up to our rigorous durability testing very well. Unfortunately, the noise cancelling isn’t quite as good as I thought it’d be. It’s not bad by any means, but in this crucial feature it doesn’t perform quite as well as some of our other models. But if that’s not a huge priority for you, they look great and would make an excellent purchase. The E-7 is a good model, and represents a reliable and attractive set of headphones. The reason it only made it to number 5 on our list, is less to do with any problems that it might have, and more to do with just how strong the rest of the list was. These come with around-ear cushions that make them very comfortable to wear. You just put them on and the soft cups will fit snuggly around your ears. While the sound quality is decent, there was a noticeable disparity between this set of headphones and the higher-placing ones on this list. Basically, I felt that I could hear songs in less detail when using this model, so we had to rank them down for that. We liked all the headphones here, and it wasn’t easy to choose a winner. Ultimately, the model that averaged out as best was our number 1 pick, the Sony MDR7506 Professional Large Diaphragm Headphone. But the other models all had great features as well. 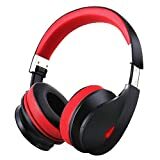 The key thing when buying is to know what is the single most important feature for you, that way you can pick the headphones that best suit what you want.